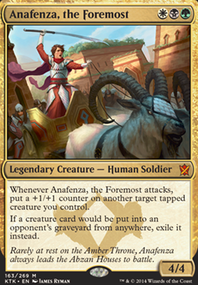 , , Sacrifice Krosan Verge: Search your library for a Forest card and a Plains card and put them onto the battlefield tapped, then shuffle your library. Love this deck! 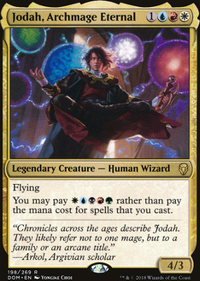 As the proud creator of a Dune-Themed Naya Deck (Hazezon Muad'dib: Dune-Inspired EDH), your concept really tickles me. 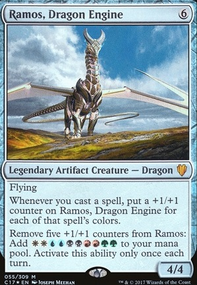 I think a tiny bit more sorcery-speed ramp would serve you well here, even with the built-in ramp on your commander. These cards are most important before you get her to stick anyhow. Maybe Nature's Lore or Skyshroud Claim ? Krosan Verge is another interesting option in your colors. All of these can snag your checkland, cycling desert, or shock too! This deck is also tailor-made for Garruk, Primal Hunter The -3 is ridiculous with your giant creatures, of course, but most importantly IT MAKES WURMS! Hope some of this helps, amigo. Keep up the good work. You might consider Krosan Verge and Blighted Woodland for further ramp. 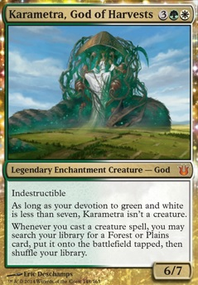 Since most of your deck is green-white, Sungrass Prairie might be a good inclusion. You could take out Myriad Landscape for Krosan Verge , that can grab all 4 colors for you (e.g. Godless Shrine and Cinder Glade ). Blighted Woodland is ramp stapled on a land. Caves of Koilos and Llanowar Wastes are also cheap. I suppose the best option would be to drop Reliquary Tower . 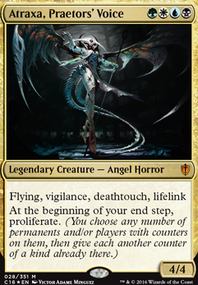 This isn't the kind of deck that's going to draw 5+ cards in a turn, so there's no real reason to run Tower. If Sanctum is staying, then it's best to treat it like Temple of the False God . Not as a 36th land, but as a late-game rock. As I said before, with Exploration and Burgeoning , you want a higher land count, anyway. 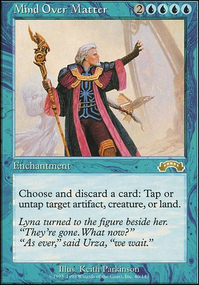 I think Hunting Grounds and Sylvan Library are fantastic additions. 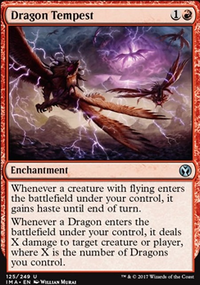 There's now a 57% chance that Sanctum can act as a 4th land drop on time, and a 77% chance Sanctum is adding more than one mana by turn 8, assuming you see 4 extra cards and no enchantments get removed. I think I would also find room for Carpet of Flowers . For me, Tempt with Discovery , Belbe's Portal , and Reliquary Tower would be the cuts for Krosan Verge , Plains , and Carpet of Flowers . 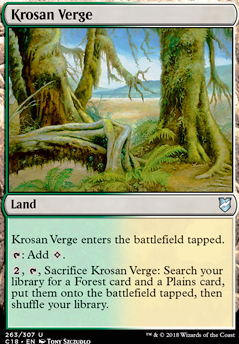 Krosan Verge can only find cards with Forest or Plains in the typeline; not all lands that produce or have the basic land type. Dryad Arbor , Sacred Foundry , and Mistveil Plains are searchable here, but Treva's Ruins or Sunpetal Grove are not. So it might be a dumb question? 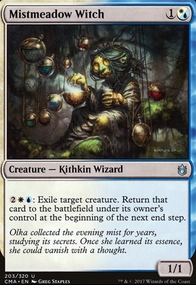 Can Krosan Verge find a bounce land like Simic Growth Chamber or a dual like Temple of Plenty ? Even if the plains or forest isn’t in the subtype? Based off of the mana symbols in their text. Or does it HAVE to state in the subtype that the land also is a plains or forest? I’m just confused because of what I’ve read on other sites and I just want a confirmation.